Mimi’s Ravioli is WAY more than Ravioli! I recently was invited to a media & food blogger event at Mimi’s Ravioli in Hollywood, FL. Although Mimi’s was new to me, this family owned and operated gourmet Italian Market and Catering company has been around for 38+ years serving the local community as well as providing many fine restaurants in the area with their wholesale products. On this night, Mimi’s opened their doors to us after hours and presented us with an amazing menu of many of their delicious homemade dishes served with Mionetto Prosecco. Mimi’s fresh Mozzarella is made hourly, stretched and salted to perfection. Their Mozzarella is a quality cow’s milk based cheese. They served us their Mozzarella & Tomato Caprese (pictured above), as well as fresh Salted Mozzarella and their handcrafted smoked Mozzarella. 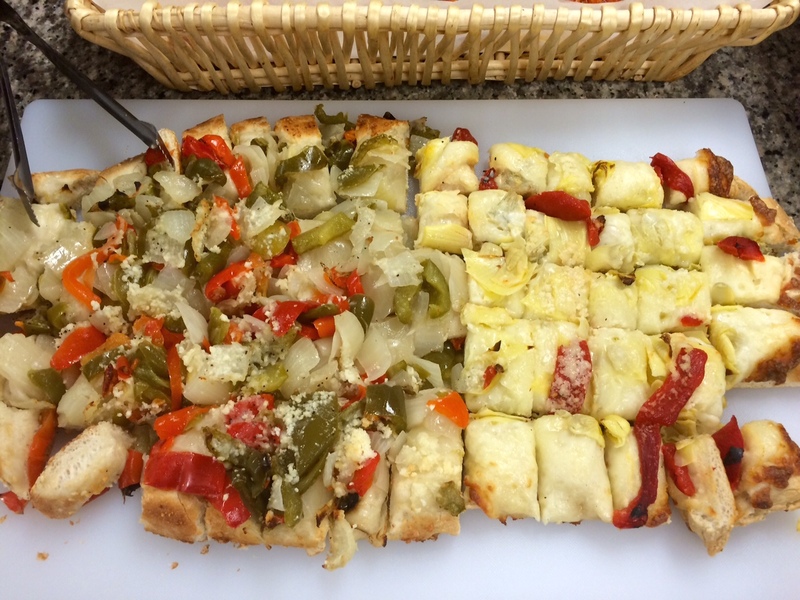 All of Mimi’s bread, focaccia’s, pizzas and rolls are made daily. Their gluten rolls have been a favorite for over 30 years, while their Ciabatta breads have now become staples to their ever day success. On this evening, they featured a few different homemade ciabatta breads, their own semolina bread, gluten rolls, sea salt focaccia bread, pepper & onion focaccia and their artichoke focaccia (pictured above). While I don’t have a pic to share with you of the beautiful display of cheeses, suffice it to say that the 24 month aged Parmigiano Reggiano that they presented us was one of the freshest I have ever had. I was certainly in cheese heaven. Mimi’s imports their Parmigiano Reggiano, Grano Padano, Provolone, Extra Virgin Olive Oils and Balsamic’s. Complimenting the cheeses there was an assortment of soppressata and dry sausages. The sides that were featured tonight were the Farro Salad, a refreshing cold salad with boiled farro, chick peas, red kidney beans, butter beans, fresh red & green peppers, EVOO, sea salt and balsamic vinegar. Chick pea Salad, a cold salad mixed with chick peas, red onions, sundried tomatoes, celery, red & green peppers, EVOO and splashed with golden white balsamic. The Eggplant Caponatta Bruschetta, a vibrant mixture of fresh eggplant, onion, celery, tomatoes, olives, capers, basil and pine nuts make this a tasty treat and one of my faves of the three sides I tried. Cheese Ravioli – these cheese ravioli are famous and were served smothered in a delicious creamy vodka sauce. I loved this dish so much that I ended up taking the frozen version home with me. Pasta al Forno – a Sicilian dish of chopped meat, tomato, onions, green peas, mozzarella, Parmigiano, Pecorino Romano & anelletti pasta. Vegetable Manicotti – covered in Linda’s sauce, handmade egg crepes filled with broccoli, spinach, bell pepper, mushroom and a hint of skim ricotta and baked in mom’s tomato sauce made with their own San Marzano tomatoes. Eggplant & Zucchini Lasagna – (No meat or pasta). I had brought some of this home to share with my meat and pasta eating hubby and he even loved this one. Layers of eggplant and zucchini stacked with tomato sauce and mozzarella form a great lasagna. Meatballs – Mimi’s own classic beef meat balls baked and sauced with their own marinara sauce. Chicken Marsala – I am not kidding you when I say this was seriously the best chicken marsala that I remember having. Chicken breast floured and fried and topped with the finest marsala wine and mushroom sauce. It is THAT good! This is another dish I just had to take home from the frozen section. Tonight, Mimi showcased their famous mouth-watering cannoli’s, chocolate mousse cake, ricotta cheese cake, New York style cheese cake and assorted biscotti. It was a lovely evening spent with some of the most gracious hosts I have had the pleasure of meeting here in South Florida. One cannot help but feel so welcome by the family and staff who work at Mimi’s. When it came time to say farewell, we were each sent off with goodie bags filled with homemade pasta, fresh marina sauce, grated Pecorino Romano cheese, two small Italian baguettes, a split of Mionetto Prosecco, a bag of wine biscuits and a couple cute Italian hats. The following day, we made the fresh pasta and heated up the sauce, broke out the Prosecco and had a delicious Italian dinner in no time at all. 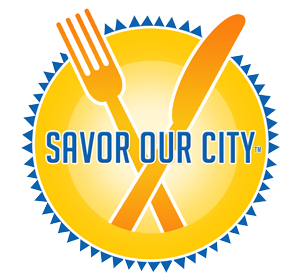 Mimi’s Ravioli is open Tuesday through Saturday from 8am – 6pm and Sunday 8am – 2pm; closed Mondays. They are located at 5714 Johnson St. in Hollywood. Check out their website for more info. Summer’s here and we all know what that means…time to get the grill ignited! But maybe it’s just too darn hot to stand before the open flames or you just don’t feel like cooking. Not to worry BRIO Tuscan Grille has got your back. BRIO’s South Florida locations have launched a three-course “Art of Grilling” summer menu available from June 1st – June 30th, Sunday – Thursday at 4pm, for just $26.95, including a choice of salad, grilled entrée with Chef- inspired toppings and a Dolchino dessert. In addition, BRIO is concurrently running Facebook & Instagram contests (now through June 30th). “The Thrill Of The Grille” contest on Facebook: BRIO fans who post their favorite grilling recipe or dish will be entered in a chance to win a chef-inspired “Gather & Grille Dinner Party for 8” at their favorite BRIO location. To enter, guests must visit the official BRIO Facebook page: www.facebook.com/brioitalian. In addition, BRIO will is hosting an INSTA-GRILLE GIVEAWAY contest on Instagram. To enter, guests will share their favorite photo of a dish they have prepared and grilled: www.instagram.com/briotuscangrille. The winner will receive a box of premium cut filets and strip steaks along with a new grill. So I was very excited to receive an invite to check out the three-course “Art of Grilling” menu at the Boca BRIO so that I could share this wonderful deal with you all. Shortly after being shown to our table, the GM Sheri Williams came by to say hello. Sheri was fairly new to this location but not to BRIO and she certainly had a warmth and demeanor about her that made you feel like you were talking with an old friend. She was excited to share with us this wine that she recently discovered and was certain that we would enjoy it, so of course we accepted, who am I to turn down a sample of wine?!? I mean I didn’t want to appear to be rude or anything… lol 😉 The wine was called Dreaming Tree Everyday White Blend. It was very crisp with a predominate taste of green apples on the palate. It was light and fruity and very pleasant. We enjoyed that with the basket of crisps that were brought to the table. I don’t know what it is about these things, but they are addicting. For our first course, we had a choice of salads: BRIO Chopped Salad, with chopped greens, tomatoes, black olives, red onion, cucumber, Feta and red wine vinaigrette; Caesar Salad with Brioche croutons, or Bistecca Insalata, a lettuce wedge with Gorgonzola, bacon, tomatoes and creamy Parmesan dressing. I decided that I was interested in trying out the BRIO Chopped Salad, but instead of the red wine vinaigrette, I asked our server if it would be ok to substitute it for the creamy Parmesan dressing. I also had my eyes on the Brioche croutons that were offered on the Caesar Salad. Our server said no problem and I thanked her for accommodating my requests. My companion chose the lettuce wedge, and enjoyed it just as is! We had several mouthwatering main course selections to choose from including: Artichoke & Boursin Crusted Pork Chop with roasted vegetables and mashed potatoes, which pairs beautifully with Sketchbook Pinot Noir; Grilled Beef Medallions and Black Pepper Shrimp with roasted vegetables and mashed potatoes, recommend to pair with the exquisite Sketchbook Cabernet Sauvignon; or Crab & Shrimp Crusted Salmon with roasted vegetables, farro, quinoa and lemon vinaigrette, which is an excellent choice to pair with Paul Dolan Sauvignon Blanc. I selected the Artichoke & Boursin Crusted Pork Chop. The artichoke & boursin crust was okay, in my opinion, but it didn’t quite hold up to my expectations. The star was definitely the grilled pork chop. It was a beautiful piece of meat, with lovely char marks and seasoned and cooked to perfection. My companion had the Grilled Beef Medallions and Black Pepper Shrimp. The beef was seasoned and cooked to perfection and the sauce complimented the dish very nicely. Both entrées had lovely seasonal veggies and the portions were generous. For a sweet end to this scrumptious three-course meal, guests can choose one of three Dolchinos (petite favorites): Caramel Mascarpone Cheesecake, featuring anglaise sauce and vanilla whipped cream; Crème Brulee, with vanilla bean and caramelized sugar; or a seasonal selection, offering the finest and freshest ingredients of the season. We chose the Caramel Mascarpone Cheesecake and the Crème Brulee. Both were FANTASTIC!!! I was thrilled when Chef Brian came over to our table to say hi and pose for a picture with me. The menu was well thought out and really highlighted what the summer grilling season has to offer, with the freshest of ingredients. Kudos to BRIO for bringing this great value to us here in Florida. Following the meal, GM Sheri offered to take me around to show me their private dining spaces. The Chef’s Table seats 22 guests; The Gallery can hold up to 55 and has A/V capabilities and the Atrium can hold up to 30 guests, also with A/V capabilities. Two out of the three rooms were currently being utilized on this night. Also at www.BrioItalian.com/theartofgrilling from June 1–30, guests will have the opportunity to bring some of BRIO’s grilling mastery into their own kitchen with various recipes, including a red wine reduction with Sketchbook Pinot Noir – great for topping or marinating steak. “We take great pride in our grilling expertise, preparing the highest quality beef, pork and seafood is an art form. When combined with freshest ingredients we create timeless, chef-inspired Tuscan cuisine” said Alison Peters, Executive Culinary Director of BRIO Tuscan Grille. BRIO locations in South Florida are at The Falls in Miami, The Village at Gulfstream Park in Hallandale Beach, The Shops at Pembroke Gardens in Pembroke Pines, Westfield Broward Mall in Plantation, The Shops at Boca Center in Boca Raton, CityPlace in West Palm Beach, and The Gardens Mall in Palm Beach Gardens. Reservations at BRIO can be made online by visiting www.BrioItalian.com. For a list of locations, please visit www.BrioItalian.com.